I had a recent chat/conversation with Jonah Keri, writer extrordinaire. We were trying to come up with a word that properly describes the web relationships we build. In today’s fast moving, instant messaging, tweeting , blogging, chatting world, we make contacts/friendships with people we’ve never met face to face. In fact, Jonah and I have been emailing, tweeting and chatting back and forth for over a year, and have yet to actually meet. I suppose this is not an entirely new phenomenon, as there have been pen pals and such for decades. But seriously, how many people had pen pals? In this modern age, we actually engage people we meet via the web. For example, I play in several fantasy sports leagues, and I have only physically met 3 or 4 of the more than 30 people in the various leagues I participate in. Yet we have almost daily contact with each other, either via email or IM. We talk smack, talk trades and forward stupid emails to each other. In fact, when we relocated to Canada, I sent an email out to all of my contacts giving them a heads up. A guy in one of the fantasy leagues responded to say that although we have never met, he was just down the freeway in Seattle, and to feel free to call on him if I needed anything. We’ve been in the same Fantasy Football league for something like 5 years. I occasionally post comments on some of the blogs I like, and have developed casual relationships with the many of the authors. Of course I Tweet, and have interaction with hundreds of people through Twitter, most of whom I have never met. Tonight my 14 year old son and I are driving to Seattle to watch our hometown Padres play the Mariners. We will be meeting up with several people from San Diego (and a few transplants like ourselves), all through meeting on Twitter. * I find this absolutely fascinating. Total strangers with common interests finding each other online and establishing relationships. *I guess these are called Tweetups. The nagging question for me is what do we call these relationships? Jonah and I have a mutual online friend, Joe Posnanski, and recently Joe pondered the same question and came up with the term “e-migo”. While it may be fairly descriptive of the interaction, “e-migo” just missed the mark for me. It’s an easy word to say, and I think it sufficiently describes our casual relationships. Like an acquaintance, it’s someone we know, but haven’t reached a point where we would consider each other friends. We kind of know each other, but not so well as to know things like birthdays, anniversaries and the like. We may even know each others spouses or kids names, but that probably came more through our online profiles than real connection. Like my buddy from the FF league, we reach out to each other and offer our help and services if needed. Kind of like an acquaintance, but not quite the same. You know, I really like that. Let me know what you think, maybe we can get it in Websters! The canning/bottling is complete and we have beer! Had to go through a couple extra steps to get ‘er done, but well worth it. We dry hopped in the secondary, and chilled it down. When we pumped it through the plate filter, the hop sack ripped and we got a lot of hops in the filter, and we wound up clogging it. If we were to run a 2nd pass on the filter, we would have lost a great deal of the hop aroma and character. 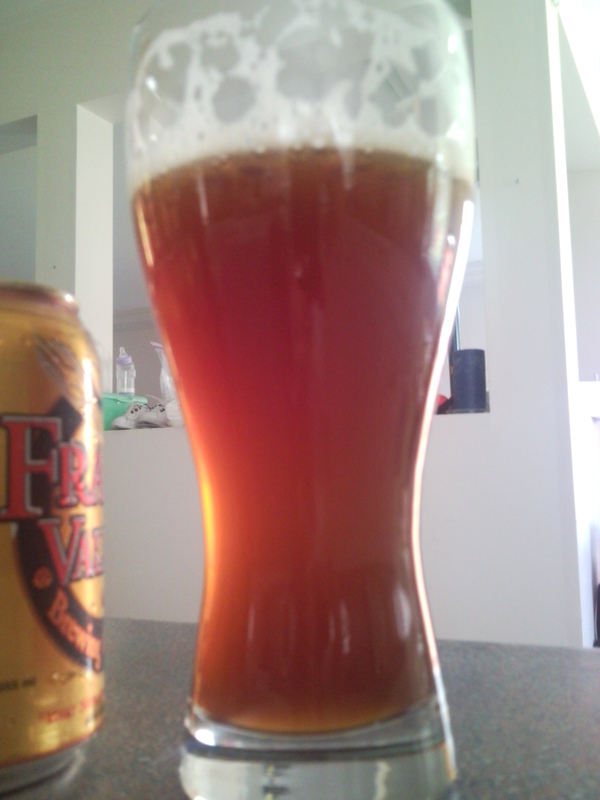 As a result, the finished product is not quite as clear as I’d hoped, but I must say, it sure tastes good! 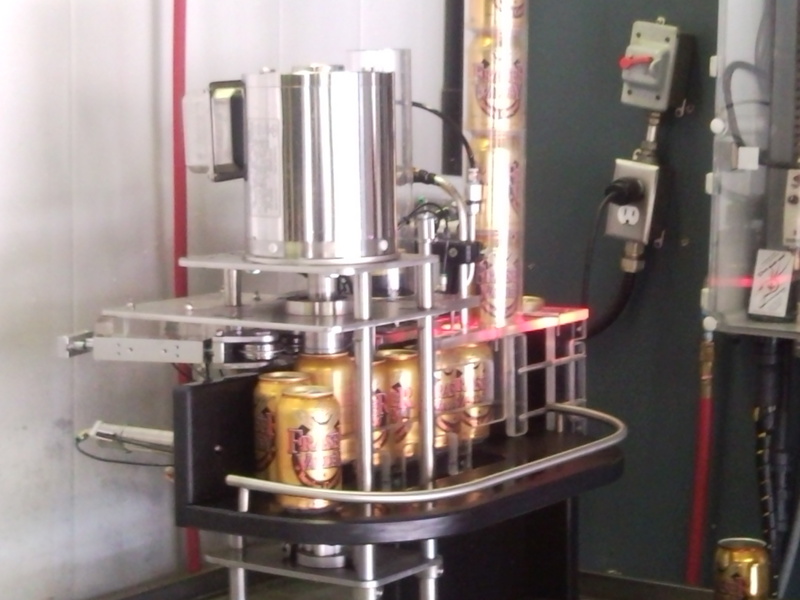 I think my favorite thing to play with at the U Brew was the auto-canner. Sure beats hand filling 100+ bottles! Did I mention that it tastes pretty damn good? Final tally: OG 1.070, FG 1.015 (Target was 1.014), ABV of approximately 7.1% (target was 7.3%), on paper it came in at a whopping 95 IBU’s, lab testing would probably put it somewhere in the 80’s. 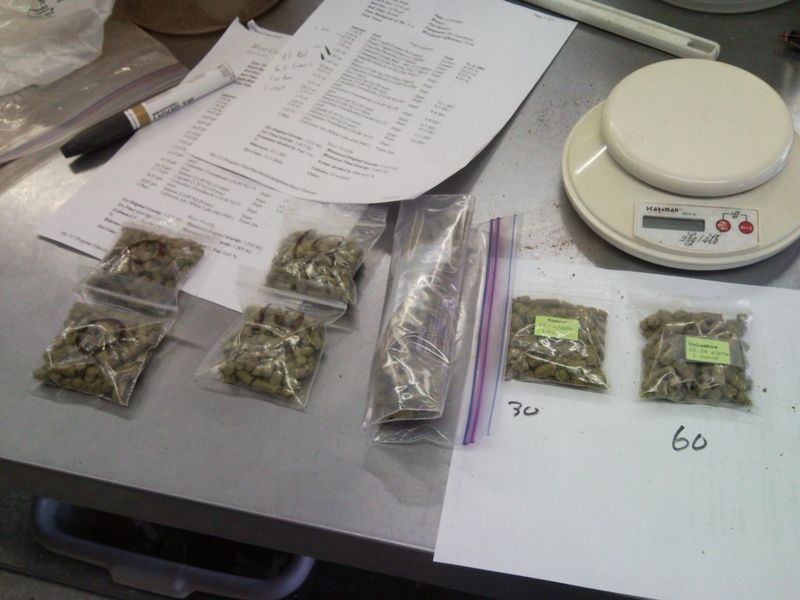 Total costs; $51.00 for hops, malts and yeast. $20 and 1 case of beer to the Ubrew for use of the facilities. We wound up with 4.5 cases, plus 5 litres in growlers. Not too bad when you figure that I would be paying in the neighborhood of $13.00 per six pack here in BC for a west coast IPA. So for the cost of a case and a half of beer, I got the equivalent of 6 cases of beer! I’ll also be using some of the beer (probabaly the growlers) as a bit of a resume when I go visit some of the local breweries and brewpubs. Now the question is ‘what do I brew next’? I’m thinking about an Imperial Coffee Porter w/ Vanilla beans, but I’m open to suggestions. Beer is in the cold room, dry hopping like mad. Goes to the filter today, and on to bottling. Should have cans and growlers for my local friends tomorrow. Tasted the unfiltered, flat version yesterday, and it’s pretty close to where I wanted it. 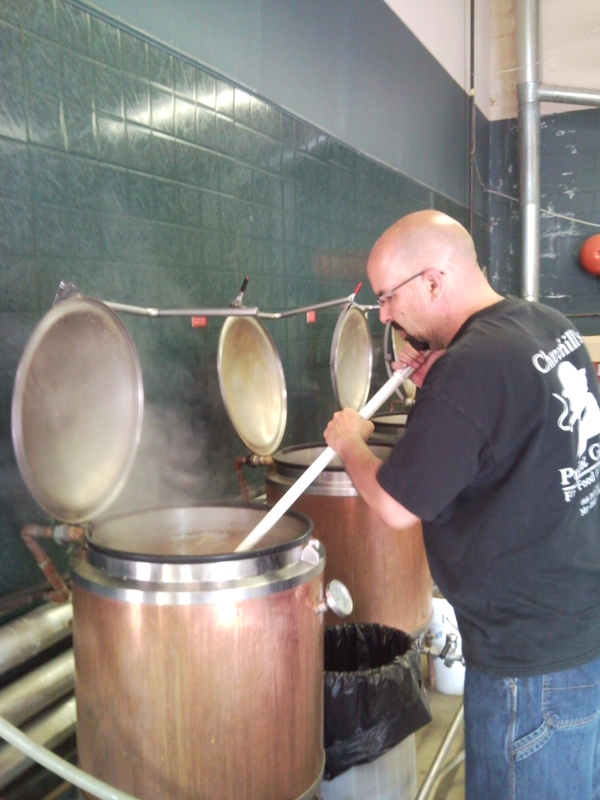 Next project is going to be an all grain Imperial Porter with cold press coffee and vanilla beans….yum! OK, on to the GIB Brockton IPA tasting. I will admit, I am a little late to the party in regards to the Brockton IPA. I’ve heard the radio spots, had it recommended to me, but still hadn’t taken the plunge. My initial impression was that it’s still a bit “too English” to be considered a “west coast” IPA. I am probably a bit biased coming from the Hop Head capitol of the world, San Diego. Literally, the West Coast IPA was born there 10+ years ago,* with the Blind Pig IPA from Vinny Cilurzo (Currently @ Russian River Brewing), which begat Pliny the Elder and the world of Double IPA’s. But I digress. *I’m sure there are differing opinions on this, as some would consider Sierra Nevada to be the first, but for me Blind Pig was the first of the ‘hop monster’ IPA’s, tons of big cirtusy hops, IBU’s , etc. After spending considerable time with Vern Lambourne, the brewmaster for GIB, I got a better insight into the Brockton IPA. My first thought was that the finishing gravity was higher than the IPA’s I am used to, but Vern corrected my impression. The English character of the Brockton is from using an English yeast strain, most similar to a Fullers yeast. The English yeast produces far more fruity esters than the “California” ale yeast which many of the US brewers use for thier IPA’s. While the finishing gravity is as low or lower than many of the US West Coast styles, the difference in the yeast gives the impression of a sweeter, maltier product. In our extended conversation, Vern also explained the ‘purpose’ of the Brockton, which is basically to be a ‘gateway’ IPA. The feeling was that to do a super aggressive IPA would not go over well with the average BC beer drinker, which I agree with. The Canadian beer drinker, for the most part, is a few years behind the curve regarding super hoppy beers. While the big hoppy IPA has been a staple in the States for 10 years or more, the style is just beginning to catch on here north of the border. Vern intimated that this could be a jumping off point for special release beers in the future, maybe even a Double IPA*. From the Brockton IPA, I moved on to Vern’s Special Bitter on Cask. Wow! As I told Vern (and anyone else who would listen to my ramblings) the bitter tasted more like a West Coast IPA than the West Coast IPA. With a more distinct hop aroma, a more grapefruit/citrus character, and a more tart dry finish the bitter REALLY jumped out for me. Vern gave me the rundown on it’s construction, which includes lots of Amarillo* hops in the kettle and in the cask. That was the citrusy hop flavor I have come to expect/lust after! *Not one of Vern’s preferred hops, but I begged him to give Amarillo a 2nd chance! As you can probably tell, I thoroughly enjoyed hanging out with Vern and Walt, the Sales Director for GIB. Both gentlemen were incredibly informative, friendly and all around good guys. Vern even invited me to come sit in on a brew day next week! After the bitter, I cleansed my palate with a Belgian Style Wit. I was immediately impressed with the fruity/funky aroma that signifies a good wit. Nice pour, with a lightly cloudy pale yellow color. Good mouthfeel, you instanly picked up the coriander/spice notes along with a mild citrus bite, which I’ll assume comes from using bitter orange peel in the boil. A very nice wit, perfect for a warm summer day, or anytime for that matter. 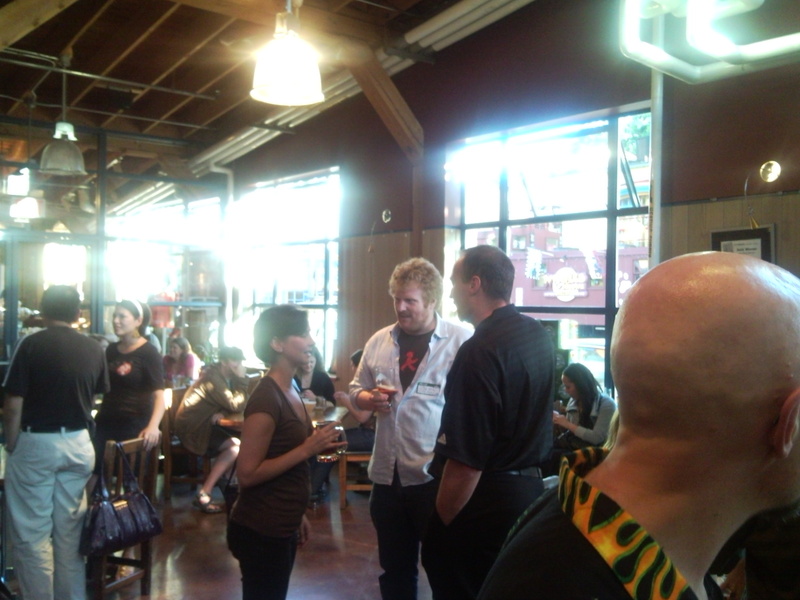 After I allowed Vern to disengage and chat with other folks, I made my around the taproom and chatted up the wonderful folks for the Vancouver chapter of CamRA*. (Campaign for Real Ale for the unitiated). They filled me in on all the great happenings here in the GVA, where to go, who has special events, and all the info a beer geek like me needs. I definitely look forward to meeting more of the CamRA folks in the near future. *Yes Lundy, I’m going to join this week! I did taste the Maple Cream Ale as well, but to be fair, I think either the keg was oxidized or perhaps the draft lines need to be flushed. I got a bit of a tinny/metallic taste, and could not really give a fair impression of the flavor. I do look forward to tasting it again. All in all, it was a fantastic evening filled with lots of comraderie and new friendships in the local beer community. I thought GIB put on a great event, and I look forward to the next one. A brewmasters dinner, perhaps? The “West Coast” IPA is almost there! 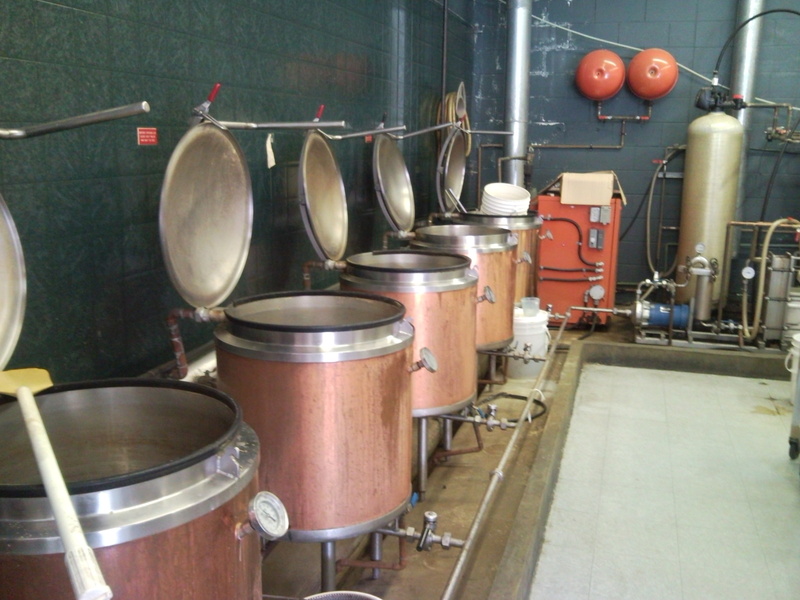 Went to the U Brew to take hydrometer readings. Currently @ 1.019, fermented down from OG of 1.070. My target is 1.014, so we’re almost there. Did a sample tasting when I did the hydro pull, and boy is it a hop bomb! Still working, I figure another 24-36 hours and this bad boy will be where I want it. At that point, I will pull the brew off of the trub/yeast and transfer to secondary vessel for dry hopping. Dry hop will be equal parts Amarillo, Centennial, Columbus and Simcoe. 4-5 days of dry hop in the bright tank and we can force carbonate and bottle this mother. I’m drooling at the thought! Well, today was brew day. I had forgotten how much I love making beer. It took more effort getting the ingredients together than I am used to, but I think that the enjoyment correlates with the effort put into the project. 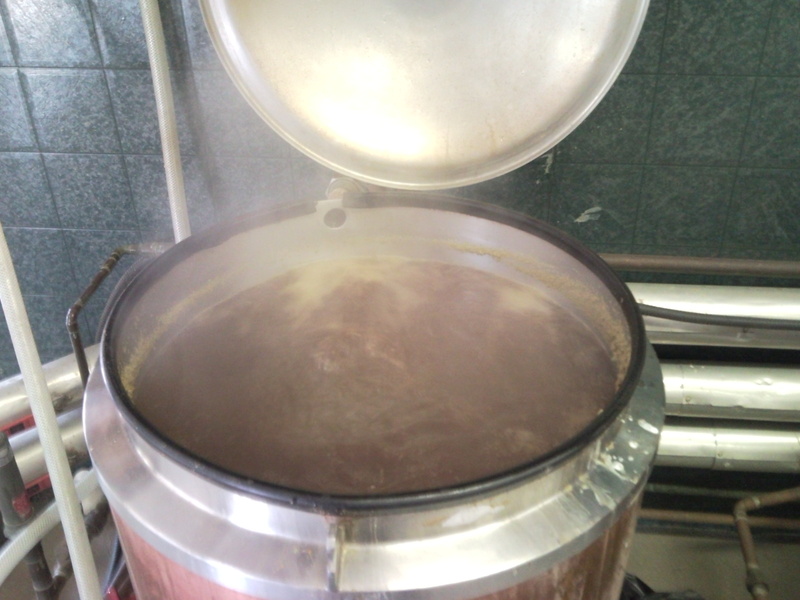 Nothing beats the aroma of wort coming to a boil. The sweetness and malt aromas are incredible. Oh wait, something does beat it; the smell of a fully hopped wort. The malt and the hops joining in their delicate dance, assaulting the olfactory senses, sending messages to the brain that soon, this will be beer! The hard work is over, now the waiting begins. The yeast is pitched and the fermentation is beginning. In 3-4 days, we’ll transfer to a secondary vessel for dry hopping. Finally, it gets chilled and filtered prior to bottling or canning. Wait, I have to wait 10 days to drink it? AAARRRRRRGH! I’ve never been a patient man. 95.5 IBU’s coming from 6 different hop additions during the 90 minute boil. Will be dry hopping with a blend of 4 hops to further accentuate the flavors of the hops used in the boil. SRM is around 11, my original goal was to be closer to 9. I think that comes from having to convert to extract/partial mash from my original all grain recipe. While I haven’t put together my post about the lack of aggressive super hoppy West Coast style IPA’s here in Canada, I was driven to brew my own. After sampling as many IPA’s and Double IPA’s as I could find, I was still left craving that citrusy, piney hop bomb exploding on my palate. I was craving Pliny the Elder from Russian River, Sculpin or Doradao from Ballast Point, Ruination from Stone…something, anything to fulfill my lustful craving for high doses of lupulin. Like an idiot, I decided to leave my homebrew equipment back in California. I figured since I hadn’t been brewing much lately, with all of the amazing beers at my disposal, I’d just store it and enjoy what BC had to offer. My bad, eh? Several times a week, I would drive by one of those BOP (Brew on Premise), U Brew It, type places. Finally I had to stop in. I told them what I wanted to make and they looked at me like I had a D**K growing out of my forehead. That’s where experience and ingenuity come in handy. No problem, says I. A couple of calls, a few emails, and Voila! I have the base recipe for the Green Flash West Coast IPA. * This is an amazing beer, if you haven’t had the opportunity to try it. 7.3% ABV, golden amber hue, and a 95 IBU floral, citrus hop aroma and flavor that’ll knock your socks off. *Special thanks to the gang at The Brewing Network for getting Chuck to divulge his secrets, and especially to brewer Chuck Silva at Green Flash for steering me in the right direction. That, believe it or not, was the easy part. It seems that none of these U brew joints do all grain brewing, it’s all extracts or partial mash. * So what do I do with my all grain recipe? Beersmith! 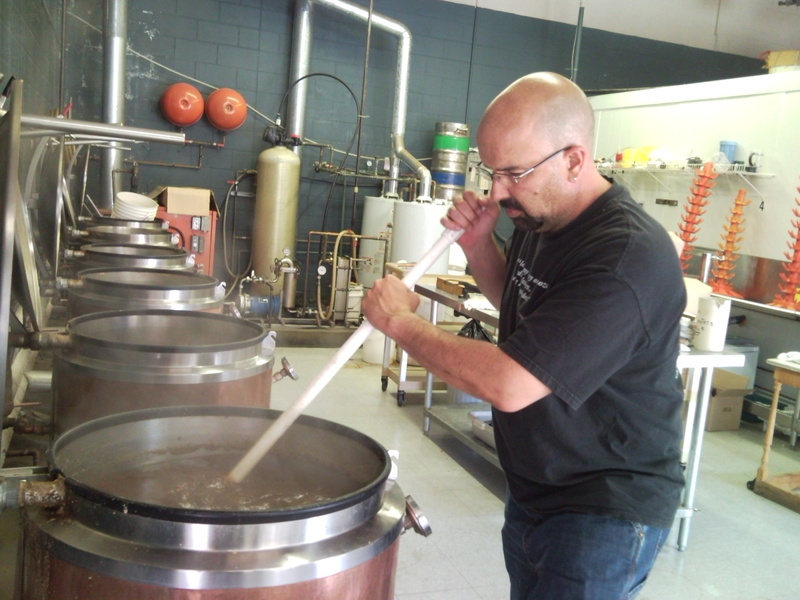 With Beersmith I was able to convert the recipe fairly easily to a partial mash batch. Now, to find hops. Of course the varieties in my IPA are not your garden variety hops, and the U Brew was again at a loss. 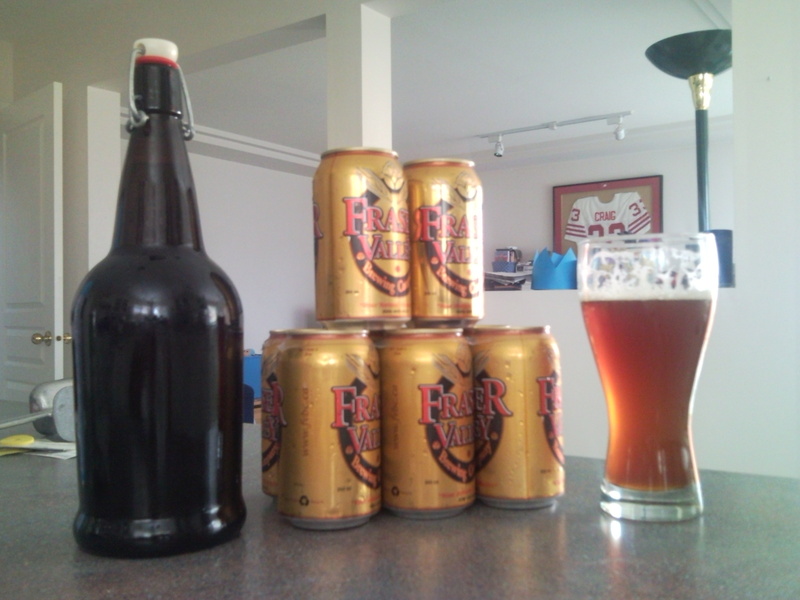 Luckily, Dan’s Homebrew here in Vancouver had everything I needed to put it all together. Brew day is tomorrow. The guys at the BOP are nervous, never having tackled something like this before. When people come in off the street to brew a beer at these places, 9 out of 10 times they want to replicate a boring, commercially available beer. It goes back to what I said in my first post; Canadians, for the most part, drink crappy beer. Much like Americans in that regard, eh? Bottom line, I guess, is this; If you can’t find a commercial beer that you love, make it yourself. Canadians, for the most part, drink crappy beer! They are very much like Americans in this regard, eh? Is it our common heritage, geography, or language that makes us this way? Is there something in our North American DNA that makes us allow ourselves to be manipulated by mass media? The desire to fit in, to go along with the crowd? People often ask me when did I become a beer snob? Believe it or not, it goes back almost 30 years, to the early drinking days of high school. When we would hustle somebody’s brother or uncle to buy us beer, I would ask them to pick up a 6 pack of something beyond Bud/Miller/Coors. In the dark days before the craft beer revolution, that meant getting something imported. Heineken, St Pauli, Lowenbrau…those were pretty much all we had to choose from at the local liquor store in those days. Of course, I would always make sure they got the dark version of whatever it happened to be. (Does anyone remember Heineken and Becks Dark?) You see, even then (at 14 or 15) I wanted to drink something I could taste. It was great, because no one wanted to drink “my” beer. Eventually, as I got older, I discovered other brands…Guinness, Bass, Watneys…mostly beers from Great Britain, with a few German’s thrown in. Different styles as well; Bitters, Milds, Porters, Bocks. Back in the 80’s, some friends and I rented a house that had this cool living room with a shelf that wrapped around the entire room. We came up with the idea that beer bottles would look really cool up there, so we scoured the local bottle shops for as many different beers as we could find. We would race home with our discoveries and have tastings in the living room, partly for the experience, partly to fill the shelf! After tasting so many new and exciting beers, there was no way I could go back to the watered down mass produced swill! As the 80’s gave way to the 90’s, the craft beer movement started to unfold. Anchor, Sierra Nevada, Samuel Adams were bursting on the scene. Traditional styles that had been dormant were revived, new styles and variations of the traditional were being produced by these pioneers. Before the internet, it was strictly word of mouth. For a short time in the early 90’s, I lived in Dallas, TX. We found this little place (I think it’s still there*) called Flips, a very quirky little jazz bar, and it was like being in heaven. We would stop by 3 or 4 times a week, just to see what was new. They had 10+ taps, all unique, as well as a bottle list which was AMAZING for the era. That’s where I had Celis White and Celis Pale for the first time. Welsh Ales, Czech Pilsners, Doppelbocks, Helles Lagers, such a world of discovery! I learned to tell an ale from a lager, a porter from a stout, a dubbel from a tripel, I learned about maltiness and hoppiness. When I moved back to California the San Diego beer scene was in it’s infancy. I discovered Stone Brewing almost by accident. I was at some generic Mexican Cantina type chain restaurant, and saw a tap handle with a big rock on it. 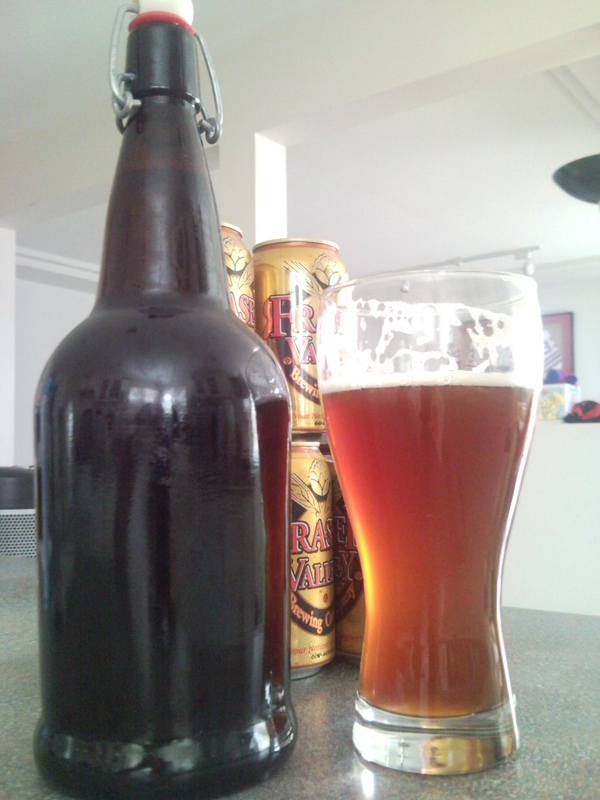 “What the hell is that?” Stone Pale Ale, another new discovery. Soon after the area was exploding with Micros and brewpubs (many of which failed). Alesmith, Ballast Point, Karl Strauss, Pizza Port, Stuft Pizza and Brewing were a few of the early adopters of this new wave of beer making. The true curse happened when my ex bought me a home brewing kit for Christmas. (I tell folks that the only good thing that came out of that marriage was the brew kit!) Such a thrill when I brewed that first batch, an Irish Stout. Then came the Pales, IPA’s, Belgian Wit’s, even a Pumpkin Beer! I frequented the local pubs, taprooms, brewpubs and home brew shops, always looking for the next discovery. I kept my day job of course, and brewed on weekends. One of my bosses had a friend who was starting a brewery, and he knew what a beer geek I was, so he suggested that I moonlight a couple days a week at the brewery. That brewery was and is Green Flash Brewing. It was a dream come true! I could still have my ‘real’ job, and do sales and marketing for Green Flash a few days a week. I stood in Costco for hours on end, proselytizing about the beer, begging people to take home a case. I visited every crappy bar and tavern, begging for just 1 handle. I ran the tasting room every Friday and Saturday, when the same 14 people showed up every week for a free buzz after work. I remarried, we started having kids, and I had to put away my play things and get a real paying job to help support the family. 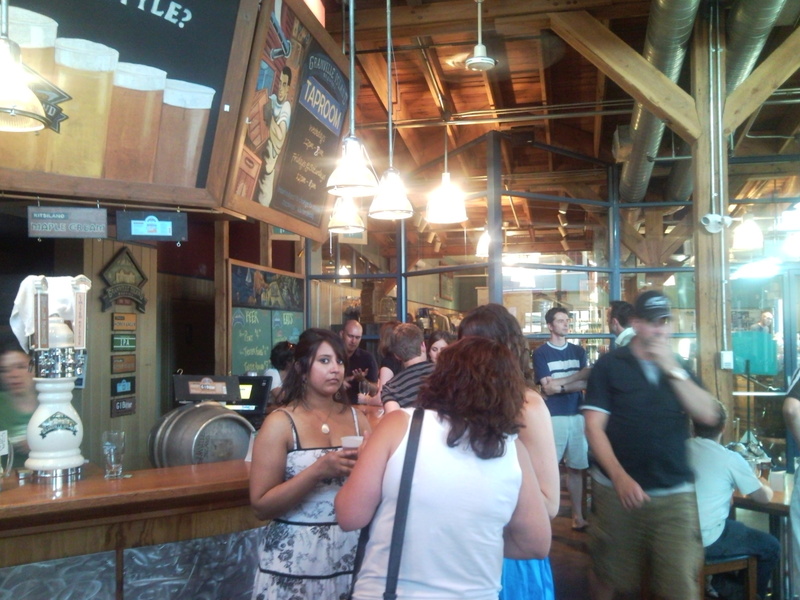 I still frequented all of the breweries and taprooms, hoping to someday go back. 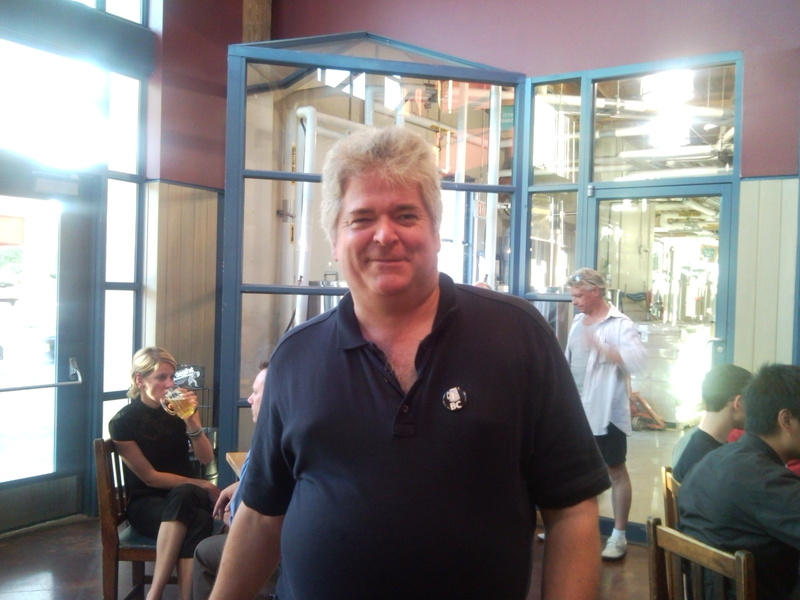 I got to know all of the brewers and owners and publicans. I watched from afar as Green Flash exploded, winning numerous medals and awards. I kept my toes in the water, so to speak, by doing promotional projects for the local breweries and pubs. Eventually my wife’s company offered her an amazing promotion, with the caveat that we had to relocate to Vancouver, BC. I did my research, saw that there were more than a dozen breweries in the GVA, and told the wife that Vancouver would be OK. Her promotion and salary meant that my income wasn’t as critical to our survival, which enabled me to pursue my dream; Working in the brewing industry. I immediately started sending my resume to all of the breweries in BC. No luck so far, but that won’t stop me. I’m doing the same thing I did in San Diego, getting out and about scouring the pubs, hitting the liquor stores, and searching the web looking for the best that BC has to offer. 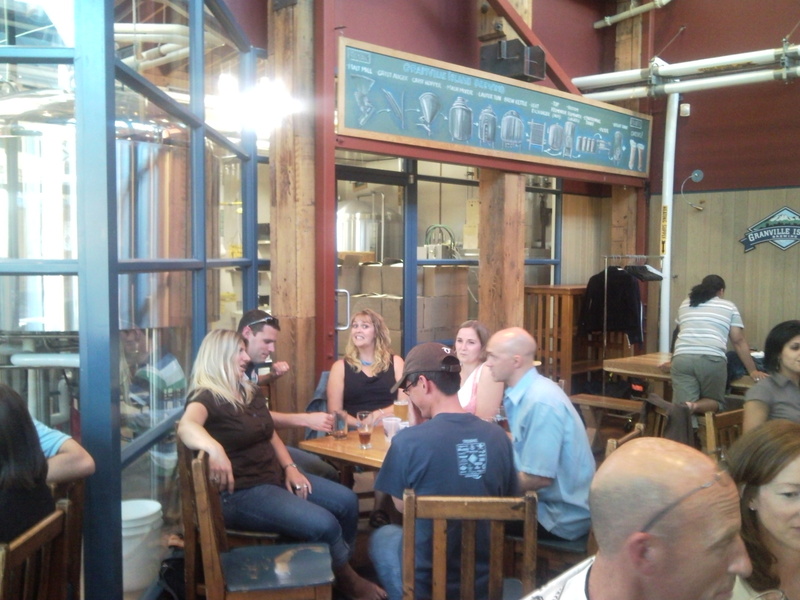 Getting to know the ‘players’ in the BC brew community, tweeting and following, learning about the beer scene here. Since I am somewhat housebound until I get a gig, I am starting this blog. Partially to fill time, partially because I love to talk and write about beer. Hell, I just love beer. It’s kind of funny, that beer quest started by a bunch of drunken kids still hasn’t ended.